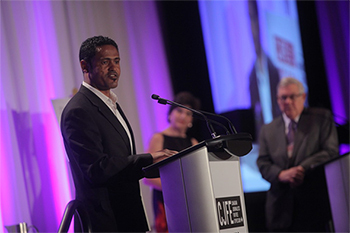 2013 International Press Freedom Award recipient Mebrahtu Teclesion Berhe accepts his award at the 16th annual CJFE Gala: A Night to Honour Courageous Reporting. The mission and motto of any journalist, anywhere, does not get any simpler than that. Şik, a freelance writer and photographer who was thrown into a Turkish jail for 376 days for doing his job, was honoured with an International Press Freedom Award. So too was Eritrean journalist Mebrahtu Teclesion Berhe, who was imprisoned and tortured for speaking out about the injustices in his country where the state controls all media and journalists are severely restricted. Ranked dead last on the 2013 World Press Freedom Index, Eritrea is one of the most heavily censored countries in the world. In Turkey, more journalists were imprisoned last year than any other place on the planet. Restrictions on press freedom don’t get much worse than in these two nations. The irony of these truths about the challenges to journalism and free expression in Turkey and Eritrea was not lost on the Canadian journalists who gathered to honour the “extraordinary courage” of Şik and Berhe, as well as Berhe’s colleagues and co-winners, Dessale Berekhet Abraham and Ruth Zecarias Ghebre, who were unable to come to Toronto to accept their awards. Listening to Şik and Berhe tell of the horrifying obstacles to reporting on corruption and injustice in their countries, many of us could not help but think about the relative press freedom we Canadians — journalists and citizens alike — take for granted. Had they been reporting in Turkey, the Star’s investigative reporters Kevin Donovan and Robyn Doolittle would certainly have been jailed for reporting that the mayor of Canada’s largest city was seen in a video smoking crack cocaine and had associated with gang members. A justice system ruled by government censor would never have allowed such damaging truths to emerge. In Eritrea, the Star’s Ottawa bureau could well have been tortured for persisting in reporting on the Senate scandal. The truths revealed in public hearings about the governance of our nation would never have seen the light of day. During the inspiring gala, the CJFE took time to praise the Star for persisting in pursuing the truth about Ford even as our reporters and this news organization faced denial and derision from the mayor and his brother and criticism and skepticism from others. But this was not primarily a night to celebrate the vindication of the Star’s reporting. Rather it was about celebrating the courage that unites all journalists who persist in fighting for freedom of expression whatever the obstacles. The universal truth we shared is that without journalists committed to the pursuit of truth, citizens remain in the dark about the wrongdoing of politicians and public officials. Şik wrote a book detailing how the Turkish police was infiltrated by the Islamic socialist movement, Gulen. He spent 376 days in jail and faces further charges of being a terrorist for which he could be imprisoned for 15 years. Still, he persists in his reporting and writing. Berhe was imprisoned and tortured over several years for investigating the detention of students in military camps and writing about the treatment of women in Eritrea. He was forced to flee to Uganda where he co-founded a website aimed at providing unbiased reporting on Eritrea. Both journalists are clear about what motivates them. They regard truth and the freedom to express truth as their highest value.